There will be four options on the main screen when the game loads. This will give the option to host or join a friend's campaign or start up the single player campaign game, as well as loading up a previous game. This allows the player to access the online play feature, choosing between Skirmish, a one off standard game, and Conquest, a territory control game. Clicking this opens up a new page with a window, with further options. Browse Servers – This allows the player to look through all the servers online, and choose which one they want to join. Favourites – This allows the player to look through the servers which they have added as a favourite. Friends – This allows the player to look through the servers their friends are currently playing on. History – This allows the player to look through the last ten servers they played on. Each server listed has properties the player can view. Name – The name of the server. Map – The current map playing on the server. Players – The amount of players on the server, and the total slots available (for example 21/32). Latency – Your ping if you were to join the server. Password – A padlock symbol to show if the server is password protected. Join – When a server is selected, this connects the player to that server. Favourite – When a server is selected, this adds that server to their favourites tab. This allows the player to customize their settings, including the controls, video settings, audio settings and multiplayer settings. Clicking this opens up a new page, with further options. 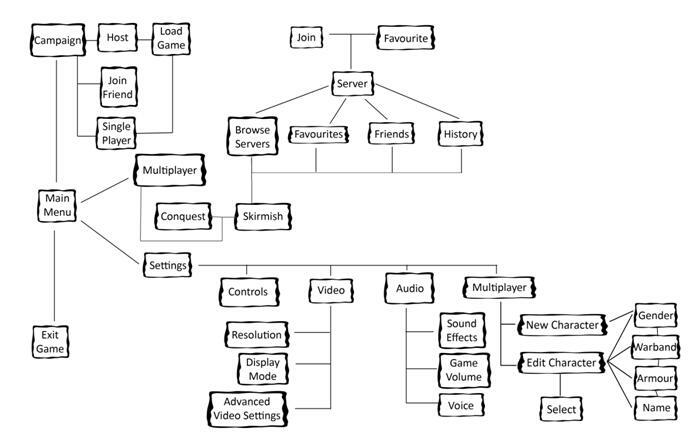 Controls – This shows the current controls, and allows the player to customize each and every key, to improve their gaming experience. Letting the player feel comfortable is key. This lets the player decide whether to play in full-screen or in a window. This lets the player customise their graphics settings. This opens a new window with further settings. Game Volume – A slider to choose how loud in-game is. Sound Effects Volume – A slider to choose how loud or quiet the sounds effects play. Speaker Configuration – This allows the player to choose between Headphones, 2 Speakers, 4 Speakers, 5.1 Speakers and 7.1 Speakers. Voice – This allows the player to choose how loud their microphone transmits their voice to other players in-game, and how loud the receiving volume of the other player's voice communication is. This opens a further window with further options. New characters can be created, or old ones edited or selected to use in multiplayer. The character creation and editing options are below. Gender – Choose male or female. Warband – Choose from which of the six Warbands you would like to play in. Select – Choose that character to use for multiplayer. Clicking this closes the game.